One of my 2016 Goals was being 100% complete with the existing Salesforce Trailhead modules. Less than a month into the year, I’ve knocked out the 20 modules I had left for that goal (at least until any new ones are released). It didn’t hurt that there was an opportunity to pick up some more Salesforce swag at the same time. What is Trailhead, you ask? It’s a great way to interactively learn Salesforce – anywhere from the more basic fundamentals of the platform for a brand new Administrator to an Advanced Developer interested in the technical details of the Mobile SDKs. This a direct replacement for anyone previously trying to learn the same content, who had to rely on release notes, documentation, code samples, or any snippets of help from community bloggers. When Trailhead first came out I dismissed the modules available as only worthwhile for those new to the platform. However, as the content has continued to evolve the level of depth of the modules as well as the increased coverage of the platform functionality started to pique my interest. In November I attended the NYC Developer Meetup‘s “Hands On Workshop: Building Lightning Components” with Christophe Coenraets where we went through one of the Trailhead projects. This really opened my eyes to the value of Trailhead and how quickly I could learn the primary concepts of Lightning Components in an hour compared to combing through the documentation on my own. At that point I had decided that I would try to start knocking out some modules to see what else was available…and by the end of 2015 I had completed 50 modules. I was refreshing old platform knowledge, learning new things I had been meaning to pick up (all things Lightning), and familiarizing myself with content that I wouldn’t normally interact with at my job (Donation Management, Wave, etc.). While some might think that superfluous information you don’t use in your day to day might be unnecessary, it gives you the ability to think about the Salesforce investment your clients (or company) has made from a big picture perspective of what the platform is capable of. 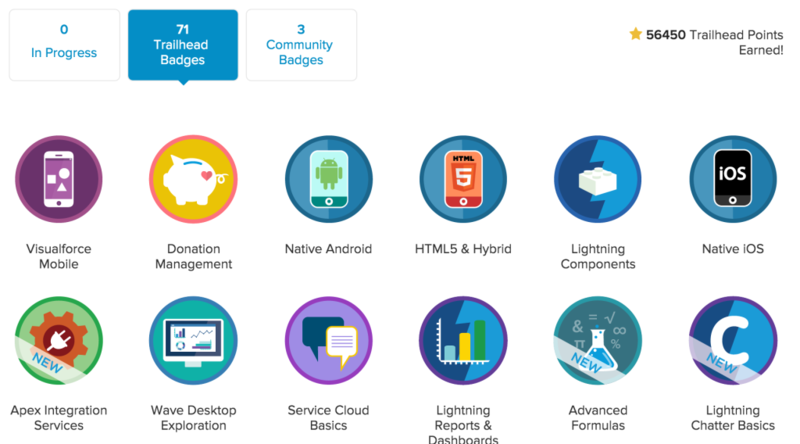 There is also something to be said about be hungry to learn, and picking up Trailhead badges is a way to publicly validate that you are willing to put in the extra effort. My final thoughts about Trailhead? It’s not just for beginners. I got a lot out applicable knowledge out of it in an extremely concise manner, and look forward to what’s coming next.